In this post I’m going to talk again about managing the time in your cameras. It sounds really boring, but there are some gotchas that photographers should be aware of. It’s something many photographers don’t give any thought, even if they actually change the camera’s time twice a year because of Daylight Saving. You need to set the time! So many of our tools for organising photos depends on the photo being timestamped, so the software can determine which day to file it under, and what order they were taken in. We tend to set the time to the same value as shown on a clock in your location (“local time”). 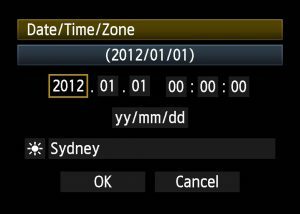 When you fire up a new camera (or after a camera’s had its memory reset) the camera will usually ask you to set the time, starting off at some initial value which is probably January 1 on a year or so before that camera model was introduced. If you press the shutter button because you just want to take photos, the time-setting screen will go away. But the camera’s time will probably default to the 1st of January 2000. The next time you turn it on it will ask you again. Each time you turn the camera on the time will start again from that initial value, which means that if you never actually set the time you’ll end up with all your photos jumbled together on one particular day long before you bought the camera. This is not imaginary: I’ve seen the results of this in clients’ image libraries! However the clock in your camera is not perfectly accurate. Over time it will probably drift, so it’s worth checking at least every month or so and change the time back to the right setting (it might have drifted by seconds or minutes). Do you really care how accurate the time is? 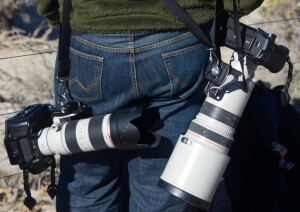 If you use more than one camera you do! Whether you’ve got two people taking photos and then merge the photo collections later, or you’ve got a different lens on a second camera body and take a few photos with it during an outing, it can quickly get very confusing if the clocks are even a minute or less apart. 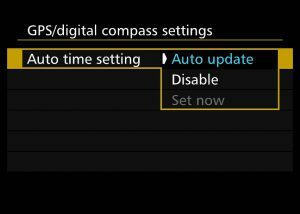 When Lightroom or other software tries to sort the photos by Capture Time, they can end up jumbled together. Keep in mind that todays’ smartphones have cameras too. Luckily the phone is usually automatically updated by the network to the correct time, so hopefully if you take some snapshots with your phone during an outing they’ll automatically slot into the right sequence with the rest of the photos. But only if the other cameras were also correct! Setting the clock manually through the camera’s menu is one way of doing it, and if you’re careful enough it’s possible to get it to within one or two seconds of the correct time. Another way is to have your computer set to the correct time (e.g. via the network time sync built into the latest operating systems) and then use a USB connection and software to set the camera to the same time. For example with Canon cameras the EOS Utility program can do this, and other manufacturers often have similar software. Sometimes the free gphoto2 software will also work. This way you can easily get all the clocks to well within a second of each other. Then there’s the GPS option. Some cameras have GPS units which allow them to attach location information to photos. The GPS system is built on very accurate satellite clocks, and these cameras can usually be configured to keep the camera clock correct by itself. 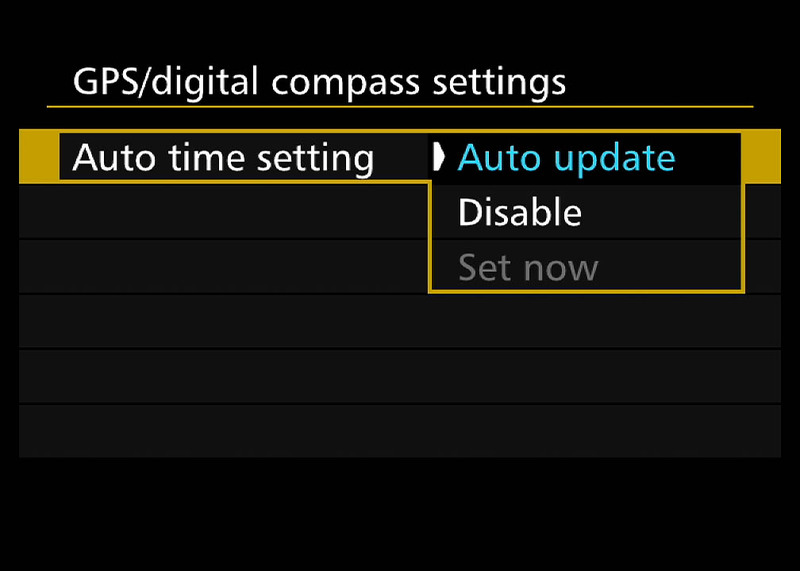 You do need to tell the camera what timezone you’re in though, as the GPS internals work on UTC (otherwise known as GMT) and it needs to know your local time offset. Whether you’re travelling (interstate, or internationally) or whether your location has Daylight Saving (Summer) Time which changes twice a year, at some point your timezone will probably change. When you change the clocks on your wall (or your watch, or your phone updates itself to the new local time) it generally saves a lot of confusion if you also change your cameras to match the new time. It can be very confusing when reviewing photos from a trip months or years later, to find a photo that looks like it was taken at night but the timestamp on the photo says that it was taken at midday just because that’s what the time was at home. It’s usual to make sure that your camera is set to the local time. 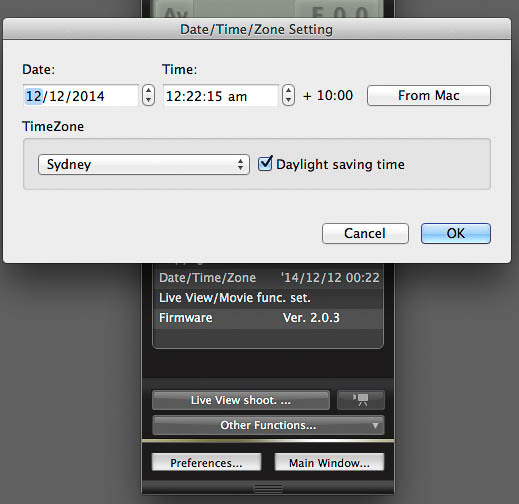 Where your camera knows about time zones, this can make it easy. Just change the timezone (or change the flag that says Daylight Saving is active) and the time updates to match. If your camera is an older model which doesn’t know about time zones, you’ll have to reset the time “by hand”. But however you do it, don’t forget! When flying internationally I usually reset the clocks to the new timezone before I land. If you forget to change the time when you change timezone, start taking photos, then at some point later realise what happened, all is not lost: you can clean things up. 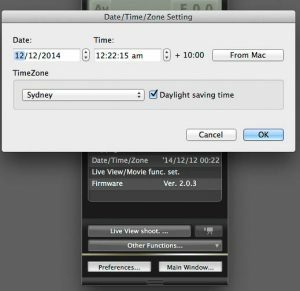 Fix the time in the camera for any future photos, and then using Lightroom (other image management software will have similar features) you can select all the affected photos and use the Edit Capture Time function to change their time/date to match the correct timezone. But if you can avoid having the mess in the first place that’s usually easier! This can also let you clean up a mess when one camera was a few minutes off from another. Use the Metadata filters to select all the photos from one camera, and then Edit Capture Time will let you adjust those photos by the required amount. Note that when adjusting multiple photos and you specify a particular time to use, Lightroom calculates for the first photo (the one shown in the window) what the change is, and shifts all the selected photos by the same amount. It doesn’t set them all to the same time! There, that wasn’t too painful was it? date/time, GPS, Lightroom, travel. Bookmark.